We help preserve the unique and important natural features of our great region. Western Reserve Land Conservancy’s roots are in the preservation of northern Ohio’s important natural resources — our mature forests, scenic rivers, abundant wildlife and great Lake Erie. And while we have expanded the scope and geographical reach of our work, the protection of natural areas remains a vital component of our mission. Northern Ohio’s wonderfully diverse natural resources are valued by an equally diverse group of people. We work closely with farmers; people who love to fish, bird watch, hunt and explore; businesspeople; ecologists and naturalists; and government officials. Our mission is to work with all of these people to preserve the unique features of our region’s amazing landscapes. In northern and eastern Ohio, the Land Conservancy helps keep those rivers and streams clean by permanently and strategically preserving land along these waterways. Our watersheds provide water for drinking, irrigation and industry. They also provide food and shelter to wildlife. Our lakes and rivers are home to world-class fishing, boating, and other activities that strengthen our communities and our economy. 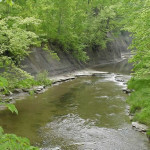 Nearly half of the streams with Ohio’s Scenic River designation are in the Land Conservancy’s service area: Upper Cuyahoga River, Little Beaver Creek, Grand River, Conneaut Creek, Chagrin River and the Ashtabula River. In addition, the Land Conservancy has heightened land-protection efforts in eastern Ohio, most of which drains to the Ohio River. Our region is blessed with an abundance of mature hardwood forests. Trees provide a wealth of benefits for humans and wildlife — among them are shelter, shade and improved air quality and flood control — and Western Reserve Land Conservancy prioritizes existing forest cover when evaluating land-protection projects. We work closely with local park systems and the National Park Service to permanently preserve forested lands that will be used by the public. But more than 90 percent of all trees in Ohio are on private land. This is where the Land Conservancy’s use of conservation easements — permanent agreements in which the landowner voluntarily surrenders development rights — is so important. We actively work to preserve forests that are threatened by possible timbering. One such case was in the Ashtabula County town of North Kingsville, where the Land Conservancy worked with residents to preserve a mature forest that was about to be clear cut. The Land Conservancy’s Reforest Our City program is also planting thousands of trees in the city of Cleveland. One of our region’s biggest challenges is protecting the health of one of the most important freshwater ecosystems on the planet. Lake Erie, the smallest and shallowest of the Great Lakes, is surrounded by fertile soils and lots of people — it is the most densely populated of the five Great Lakes basins. This combination of agricultural land use and high population density makes Lake Erie more susceptible to the effects of urbanization and agricultural runoff. The Great Lakes contain about 20 percent of all the world’s fresh surface water, so it is vital to our region’s health and economy to ensure that Lake Erie thrives. Clean, healthy water is a true asset for our region. At the Land Conservancy, we believe that preserving water quality today and for future generations is a great investment. Sometimes it is not just about the land. It is about what lives there. Land Conservancy staff members, partners and other experts sometimes identify regions with habitat for rare or endangered species. In many instances, we make a special effort to preserve those areas, through donated conservation easements, purchased easements or outright acquisition by a park system or government. In Ashtabula County, for example, we have helped preserve more than 1,000 acres of habitat for the endangered Eastern Massasauga Rattlesnake. Our partnership with the Lake Erie Islands Chapter of Black Swamp Conservancy and Put-In-Bay Township resulted in the creation of the 9-acre Scheeff East Point Nature Preserve, which protected South Bass Island habitat for the then-endangered Lake Erie Watersnake. We have preserve land along some of the tiny, cold streams in Geauga County where naturalists discovered native Ohio brook trout — a unique species once believed to be extirpated. And we are preserving land in eastern Ohio that will protect the endangered hellbender salamander. Wetlands are the sponges of our natural areas, controlling, buffering and cleaning water. Across our region, glacial features and natural processes have given us diverse and rich wetland areas. 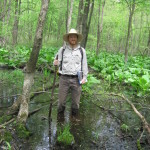 These swamps and lowlands are extremely important to the health of lands, lakes and streams. Vernal pools are wetlands that fill up annually, but typically dry out in the summer. They are important and special because they improve water quality by acting as filters for rivers and streams. Kettle holes are shallow, sediment-filled bodies of water formed by retreating glaciers or draining floodwaters. Here in northern Ohio, they were formed thousands of years ago when glaciers moved out of our region and left a trail of melting ice behind. And peat bogs are acidic wetlands, generally with no outlet for water. Peat is an accumulation of partially decayed vegetation. Peat bogs usually grow slowly, at the rate of about a millimeter per year, which is why sustainable large-scale peat extraction is not realistic, since extraction is always faster than growth. Northern Ohio has a rich and diverse wildlife population. One of the Land Conservancy’s goals is to create connected, preserved corridors, which are beneficial to people as well as animals. Birds, butterflies, deer, rabbits, fish…all benefit from our land protection efforts. The Lake Erie shoreline is one of the most important stopovers for birds making their way from Canada to the South and back again; nearly 400 species have been identified on the 312-mile Lake Erie Birding Trail. Our streams are teeming with steelhead trout and smallmouth bass, while Lake Erie boasts an amazing walleye population. Wild turkeys now roam every part of our region. Our region’s coastal breeding grounds are very important to butterflies, which seek out the very best soils. Like butterflies, dragonflies can be a great indicator of environmental health. Where we see strong dragonfly larvae growth, we know we have healthy water quality. Learn more about how we conserve vibrant natural areas.